NOTE: A word about the production tables. 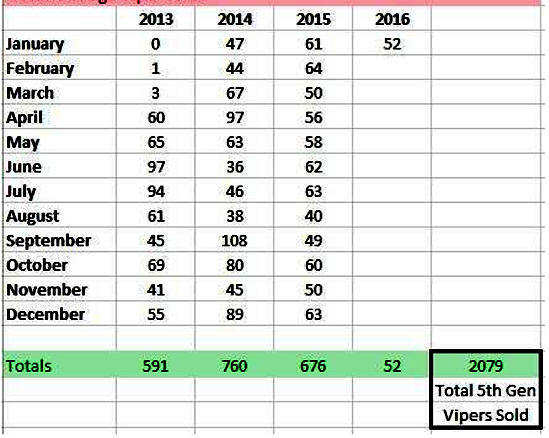 Trying to figure out Viper production figures is like going down the "Rabbit hole" or entering the "Twilight Zone". There are many numbers from several "reputable" sources. of the best numbers out there. Take them for what they are. 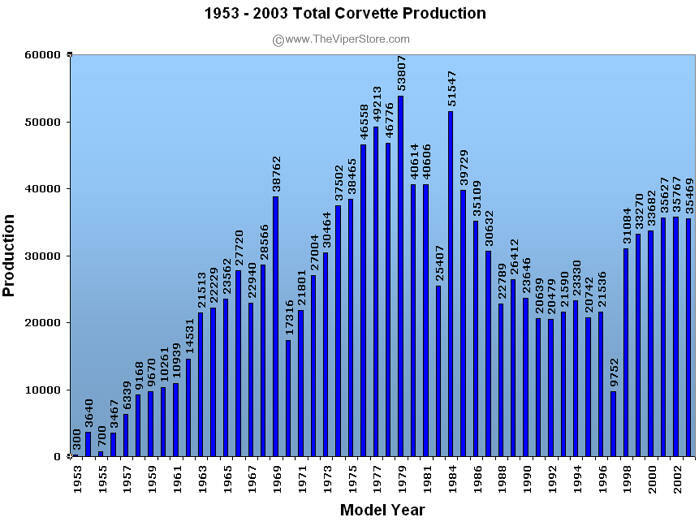 ***Chevrolet Produced about 27,000 Corvettes in 2014 alone. ** Includes cars built in CY 2007 production. Total 1997 Viper build: 1788 (1762 retail, 26 Pilots), Last '97 off the line was VIN #302580 (others had higher VIN's, but this was the last unit off the line). '98 numbers include 12 pilot and pre-production units (6 roadsters and 6 coupes) which will not be sold. but not in '98, as there was no '98 Prowler); Therefor, '96 and '98 Vipers have exclusive VIN sequences, '97 and '99 are shared with the Prowler. '01: No Export (BUX) sales. Total Monotone: 1392, Total Stripes: 359. '05: Coupe: No Export (BUX) Coupe and 7 Mexico units. Convertible: 162 Export (BUX) and 8 Mexico units. 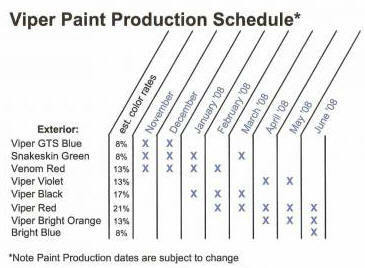 1 - Exterior color changed (from red), interior changed (from gray) by factory as development/trial. '97: Three red '97 RT/10's were ordered with the "Gold Package" (gold sparkle wheels, and a gold snake emblems on the hood's sides) and a tan interior. This is the lowest factory shipped color combination to date. One solid blue RT/10 (no white stripes) with black steering wheel, shift knob, e-brake manufactured. pre-'98 RT/10" facia. All other '98 RT/10's were manufactured with NACA duct and vented hood and GTS style front facia. '99: 169 Roadsters with Cognac Connolly Leather interior: 3 Red, 50 Silver, 116 Black. '00: All RT/10's were built with five-spoke polished wheels. '97: Fourteen yellow wheeled GTS's, and seven gold wheeled (not gold package, these did not have tan interiors) GTS's manufactured. shipped with a "smooth" (no NACA or vent ducts) hood and pre-'98 RT/10 front facia. 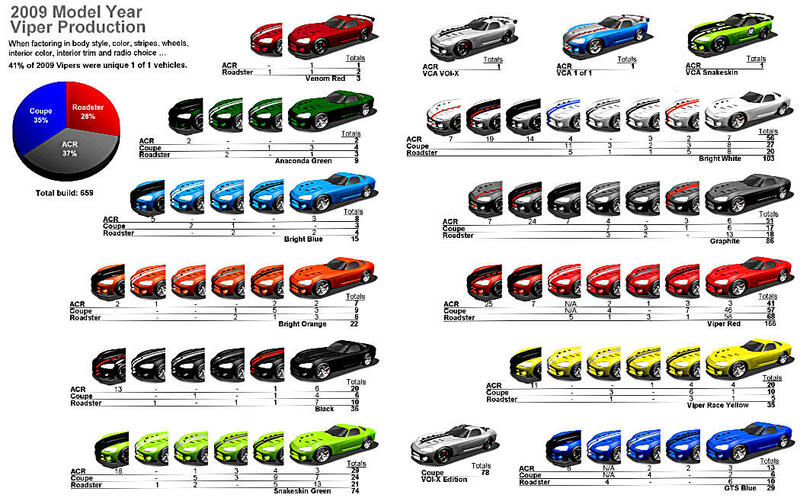 '99: 247 of 699 Coupes had Stripes. 128 Coupes with Cognac Connolly Leather interior: 3 Red (late release), 22 Silver, 77 Black, 26 Black with Silver Stripes. Rims was built as the Viper Club of America Raffle Car. '02: Final Edition GTS's were built with an exclusive red/white paint scheme with red stitching on the interior. There were 360 made, with 326 being non-ACR cars. '99: Only 9 ACR's were built without A/C and Stereo Comfort Group. '00: Only 17 ACR's were built without A/C and Stereo Comfort Group. '01: Only 4 ACR's were built without A/C and Stereo Comfort Group. with an exclusive red/white paint scheme and red stitching on the interior. custom painted with VOI.7 Nashville "Guitar Theme"
'06: 100 Stone White VCA Editions: 9 delivered with Mopar Performance Option (installed by Prefix), 13 Vegas drive-away (designated by VOI logo on A-pillar). 2011 ---- No 2011 model year Vipers.